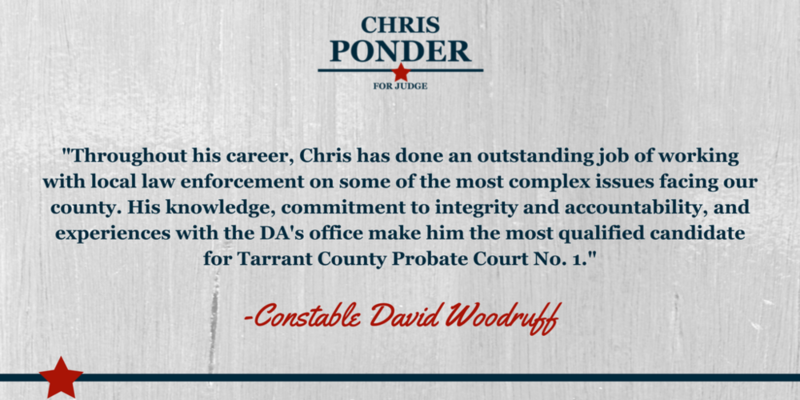 I wanted to let you know why I endorsed Chris Ponder for Tarrant County Judge Probate 1.
has been a huge asset to Tarrant County Citizens over the years. As you know Probate Court handles the administration of wills and estates, but many don't know, it has exclusive jurisdiction over mental health cases in our county. Chris' time as Chief of the DA's Mental Health Unit overseeing these cases in the Probate Court gives him unique experience, greater than any other candidate in this race. Another thing most people do not know Chris best for, several years ago Chris was willing to stand with me, (sticking his own neck out) to challenge the fraudulent filings on Adverse Possessions during the squatters epidemic. Everyone in the county was slightly reluctant but Chris, agreed with me that it was a fraud. He supported me on taking immediate action on each property. He gave me the "green light" to issue Criminal Trespass Notices" and kick people out of each home "immediately". Chris's evaluation later brought in the County and District Clerk to work to protect Tarrant County homeowners. This was a very bold move and later proven to be justified in court when all individuals involved in this scam were charged and convicted of burglary along with various other charges. Chris is not afraid to do the job and has the personal fortitude and knowledge to research and solve problems. He is a strong conservative family man with the highest of ethics. I would be honored if you would consider joining me and endorsing him. Political ad paid for by Chris Ponder Campaign, P.O. Box 782, Colleyville, TX 76034, in compliance with the voluntary limits of the Judicial Campaign Fairness Act.